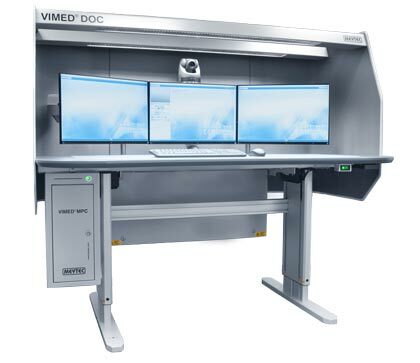 The telemedicine system VIMED® DOC is a professional workstation for both telemedicine centers, as well as, hospitals. In comparison with the workstations one or two monitors VIMED® DOC provides a fatigue-free work environment for prolonged periods, thanks to the fully ergonomic design. The design and lay-out allows one person to deliver a high volume of medical data consistently and effeciently. The system was designed together with practicing physicians and developed in accordance to their specific instructions for telemedicine centers. We therefore recommend the VIMED® DOC especially for the use in teleradiology, teleneurology, telecardiology and teleoncology. Furthermore the general concept provides a solution in other interdisciplinary fields of medicine. Regarding this fact, the telemedicine system represents an important hub for interdisciplinary cooperation of medical professionals, both nationally and internationally. Professional solution for audio and video communication, e.g. for diagnostics, second opinion etc.